This slot machine from Novomatic is a simple fruity slot game. If you’re a slots player who likes games with special features then this isn’t the choice for you! Red Hot 20 is a good choice for any novice slots player or for any player who just enjoys a good, old, simple slot game. 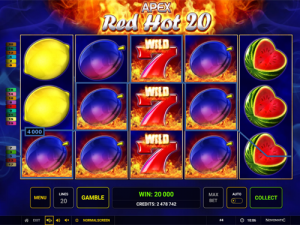 Red Hot 20 is aptly named as it has 5 reels, 3 rows and 20 red-hot paylines! The background is pretty boring, as is the logo. The reels are in front of a blue background with some orange flames licking the logo above them. The symbols are all fruits and there is also a star and a seven. While this might not be a very complicated game, it is a decent slot. Novomatic are known for making great games. They might not be the fanciest games but they always work and they always pay out! When you play games from other vendors, you could play 10 times on 10 different days and lose money before you get a good run on the slot. Novomatic games are different, though. That’s why they are so popular! Normally they have good payout percentages (RTPs), averaging around 95-95%. Novomatic normally also add their signature music and sound effects to the game so, if you’re familiar with the developer, you’ll hear when you get a big win as you’re bound to recognise the sound of the bell! In fact, you’ll know when you get any sort of win – and that will happen often! Red Hot 20 does have a gamble feature, so it’s not all boring. Wilds and Scatter symbols also feature in this fruity slot. Give it go if you’re a beginner and you won’t be disappointed! Other beginner-friendly slot games from Novomatic include: Fabulous Fruits, Golden 7, Plenty of Fruit 20, Just Jewels Deluxe and Xtra Hot. In Red Hot 20, when you get a win, the winning symbols erupt into flames! This makes it easy to tell when you get a win – so that’s great for beginners. Many games from other developers just add the win to your balance but don’t really show you the win clearly. These games are pretty confusing to play! If you’re starting out as a beginner, then Novomatic games are a good bet. Especially Red Hot 20! There’s nothing unique or unusual about the paylines in this game. They run across the reels from the leftmost reel to the rightmost reel. You can see the paths they take by opening the paytable. At least three matching symbols across a payline is needed for a win. These matching symbols must follow a payline on consecutive reels, beginning with reel 1 on the far-left. The higher number of matches you get, the bigger the payout will be. Also, not all of the symbols give the same value payouts. The symbols with the lowest value payouts are the orange, the lemon and the cherries. The plum and the watermelon are twice as valuable as those three fruits. The grapes are twice as valuable as the plum and the watermelon! Even more valuable than the grapes is the red seven and the star. In fact, the star symbol will pay out 500x your bet when you land 5 of them in one spin! The star is a Scatter symbol which means that it doesn’t have to follow paylines and it will pay from any position on any reel when three or more land in a single spin. The red seven is valuable on its own but it is also valuable when mixed with other symbols! It’s the Wild symbol so it can complete a win for any other symbol by acting as a substitute. It can’t fill in for the Scatter symbol, though.